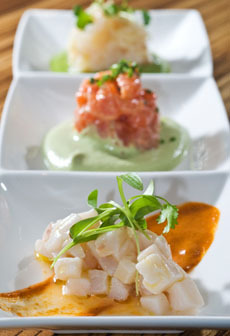 Ceviche three ways. Photo © James Camp | Dreamstime. This is Page 1 of a three-page article. Click on the black links below to visit other pages. Both Ecuador and Peru claim to have originated ceviche: Both were part of the Incan Empire. But why quibble: Today, ceviche—or seviche or sebiche, depending on the country—is so popular that there are cevicherias, restaurants that specialize in ceviche. The Spanish brought the lime and onion that is integral to modern ceviche. In fact, the term “ceviche” is thought to come from the Spanish escabeche, meaning marinade. Others argue that the word comes from the Quechua (Incan) word siwichi—although we could not find this word in the Quechua dictionary we consulted. There’s a whole menu of ceviche, using difference types of fish and seafood and country-specific preparations. Each country adds its own spin based on local seafood and preference for ingredients like avocado. Some add a dressing of ketchup or a combination of ketchup and mayonnaise (think shrimp ceviche with cocktail sauce). 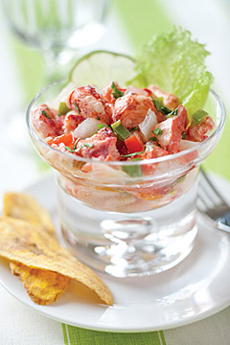 Lobster ceviche. Make it or order it from MackenzieLtd.com. Add your own individual touches to your ceviche. Start with inspiration from our list on Page 3.